The prominent Lebanese architect Joseph Philippe Karam was born in Beirut in 1923. The fourth child of a public worker and a homemaker, Karam spent his childhood and adolescence in Beirut in the 1920s and 30s. His family originated in the historic village of Beiteddine in the Chouf mountains southeast of Beirut, where Karam spent his childhood summers. Karam’s life and career span some significant milestones in the history of modern Lebanon. He was born three years after the birth of the new nation, graduated from college at the start of its prosperous era, and died at the beginning of its civil war. In 1920, following World War I and the breakup of the Ottoman empire, the land known today as Lebanon was placed under French mandate by the League of Nations, and the French governor proclaimed the creation of ‘Le Grand Liban’ in its current borders. The influence of French culture and language, present in the region for centuries owing to the historic ties nurtured by its Christian population with France, were now again strongly on the ascendant. Many Lebanese Christians had taken to giving their children French names and to sending them to French religious schools. And so with the Karam family, young Joseph, son of Philippe, was schooled at Beirut’s French Jesuit school. This openness to Europe led many Lebanese of Karam’s generation to embrace the modernist movement in culture, in science and education, in art, and in architecture. World War II was relatively uneventful in Lebanon and Karam graduated with diplomas in Mathematics and Engineering-Architecture in 1946 from the Universite Saint Joseph’s Ecole Francaise d’Ingenieurs et d’Architectes (now renamed ESIB, or Ecole Superieure des Ingenieurs de Beyrouth). At the time, the reconstruction of post-war Europe and the tonic effects of the Marshall Plan were being felt by the economies of countries lying on the periphery of Europe. Lebanon in particular, had recently gained its independence from France in 1943 and seemed well-positioned to benefit from the new peace. The small nation, strategically situated between Europe and the Arab oil fields and enjoying an educated, multi-lingual and entrepreneurial middle-class, entered a period of economic growth and prosperity which lasted for several decades. Karam’s career which started as the guns of WWII fell silent, and which ended with his death in 1976 at the onset of the Lebanese civil war, symbolically book-ends the era of modernization and optimism which characterized Lebanon in that 30-year span. In the field of architecture, Karam was indeed seen as the leading proponent of modernism in Lebanon, the modernism of Le Corbusier, of the Bauhaus, and of the International Style. Karam founded his practice, the Atelier d'Architecture Joseph Philippe Karam, in the late 1940s, a design office modelled on the practices of the leading European modernists. The Atelier's work had a significant impact on the urban landscape of Beirut and of Lebanon. 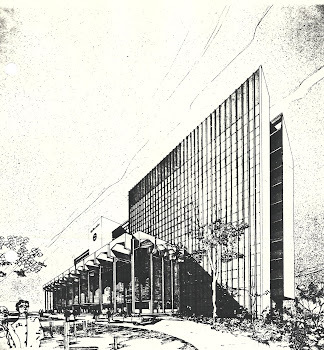 He built a large number of residential, institutional and commercial projects in the 50s, 60s and 70s. In the last decade of his career, Karam designed several large-scale projects in Saudi Arabia. 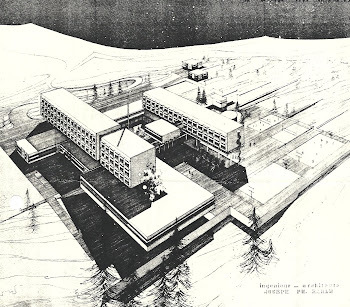 Karam’s architecture and his use of concrete and glass were heavily influenced by the modernist movement which started in Europe between the two world wars and spread to the rest of the world after WWII. One finds in his various works the revolutionary creativity of Le Corbusier, the fluid, more refined, formality of Oscar Niemeyer, and occasionally the brutal power of Kenzo Tange. Karam's first large project was a residential building on Rue Verdun in downtown Beirut. Completed in 1956, the structure still projects today a dominating presence on the sloping street. Here can be found several precursors and hallmarks of the architect's future designs: an aggressively-articulated facade which breaks with convention, a large mass raised on pillars, a free-flowing ground floor housing shops and restaurants, and a roofscape which departs from the vocabulary of the main mass below. In the 1950s and 60s, Karam designed several residential buildings in the Foret des Pins – Badaro area of Beirut. Among these were the Forest apartment building and the elegant Karam building, the architect’s residence. A common feature of these buildings is the lifting of the main mass on heavy pillars, leaving the ground floor light and airy. In several instances, Karam also incorporated masonry claustras in the façade for decorative purposes or as ‘brise-soleils’ (sun shields). The Karam residence has two other unique features: at the ground entrance, a shallow pond, almost Japanese in character, with an arched bridge, waterlillies and red fish; and seven floors up, a rooftop garden, part of the architect’s residence. Karam’s residential buildings, indeed most residential buildings in Lebanon, offer generous terraces, allowing occupants to enjoy the country’s mild weather and abundant sunshine. Not far from Badaro, along the Avenue Samy El-Solh, two commercial buildings add to the architect’s footprint in this part of Beirut, the triangular Philips showroom and the Banque Libano-Francaise. Another area of Beirut, the Raouche waterfront district, also benefited from several Karam designs, notably the imposing Shams building with its colorful facade and the ‘La Gondole’ center with its playful and curvy front. 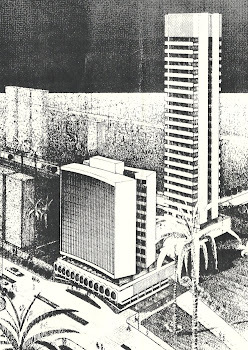 Karam also took part in an extensive proposal to redevelop Raouche, but the project was eventually shelved by the city of Beirut. Further south along the coast can be found the modern Tabet House designed by Karam in the 1960s. 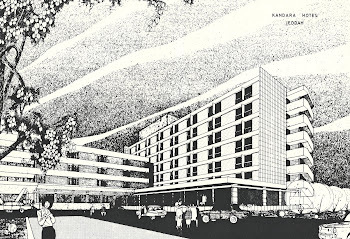 In the 1960s, Karam won the commission for the second phase of the Phoenicia Hotel, at the time part of the Intercontinental Hotels chain owned by Pan American Airways. The first phase, a low-rise concrete structure built opposite the Baie de St George and the Mediterranean sea, had been designed by the American architect Edward Durrell Stone in the 1950s. Karam mimicked Stone’s exterior theme in the new high-rise addition, while putting his own mark on the large expansion of the lobby area and interiors. During the city’s golden era, the Phoenicia and the neighboring Hotel St George were de rigueur Beirut addresses for well-to-do tourists, businessmen, and even international spies. Guests of the hotel long remembered its curvilinear swimming pool and submerged bar. More than any supposed physical similarities, it is this experience of opulent hotels, exciting nightlife, liberal and international culture with Levantine roots and French veneer, which earned Beirut its famous appellation as the “Paris of the middle east”. A symbol of that time, the Phoenicia was one of the first casualties of the civil war, as various militias in 1975-76 battled from its luxurious rooms their enemies holed up across the street in the Holiday Inn. Both shell-scarred and burnt high-rise structures stood as hollow ghostly hulks for the remainder of the war. The Phoenicia has since been renovated. 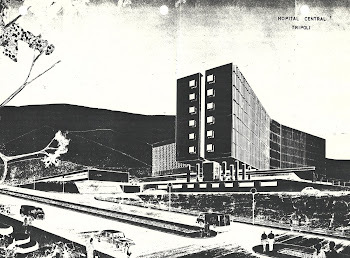 In 1965, Karam was the designer of the Beirut City Center, a multi-use complex with an egg-shaped shell housing a cinema, surrounded by towers and at the time the largest shopping mall in the middle east. The outbreak of the civil war in Lebanon in 1975 left the structure damaged beyond repair. Most of the buildings were razed but there have been some efforts to rehabilitate the egg (also nicknamed ‘sabouneh’ or soap by locals) which has survived, and which now occupies an iconic place in the hearts of Lebanese nostalgic for the country’s prewar era. In June 2004, a front page article in The Wall Street Journal discussed some designs to preserve and restore the egg. 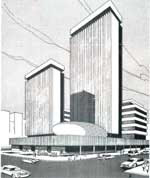 The architect’s reputation was growing beyond Lebanon and his career reached an important milestone in Saudi Arabia when he won from Her Royal Highness Princess Effat Muhammad Al-Thinian, wife of King Faisal, a mandate to design a large-scale residential and commercial project on the prestigious King AbdulAziz Street in downtown Jeddah. 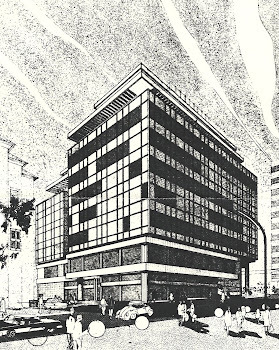 The complex, known today as the Queen's Building, incorporated a slender 27-story residential tower and a lower commercial building with an elegant concave glass façade, sitting atop a 3-story shopping mall and garage. 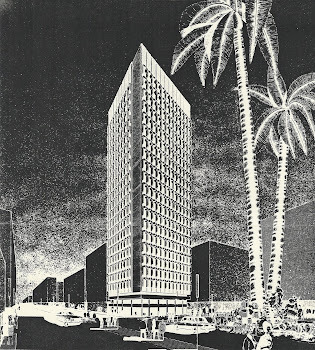 Several commissions quickly followed in Saudi Arabia for hotels, office buildings and residences, some of which were completed in the 1970s. In some of these projects, which were still firmly grounded in the modernist movement, Karam began to incorporate details with motifs and patterns that were distinctly Arab or local. This perhaps suggests a slow but growing tendency in the architect’s work away from strict modernism and towards a more vernacular or post-modern vocabulary. In the early 1970s, Karam designed the first phase of the Aquamarina beach resort north of Beirut, at the time the largest in the country. 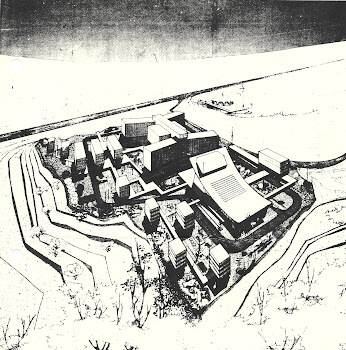 The proposed site was uniquely appealing with a cliff overlooking a quiet cove at the northern end of the Baie de Jounieh, and offering a spectacular view of the bay, of the pine-covered mountain leading to Harissa to the southwest and of the city of Beirut jutting out to sea twenty miles to the south. Karam’s innovative design, indeed revolutionary for its time, placed the main swimming pool and restaurants on top of the cliff, with a glass elevator connecting them to the marina below. A desire to capture the breathtaking southeasterly and southwesterly vistas led to a geometric triangular theme in the project’s master plan, a theme which can be found in the plan of the main tower and of the adjacent lower buildings. Each of these structures was organized to house its elevators, mechanical, and ancillary spaces to the rear, so that each and every residential unit was in the front and offered its own beautiful view of the bay. 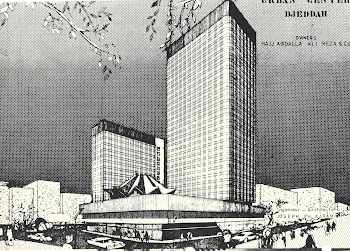 A commercial success on the eve of the Lebanese civil war, Aquamarina grew later in several phases, notably with the addition after Karam’s death of a handsome Corbusier-inspired low and long structure designed by the architect’s eldest son Fadi, an architecture graduate of ETH in Zurich. The most striking features of this addition are the westernmost stairwell tower with its dramatic cantilevered basket-like appendix overlooking the marina, the sculpted water tanks on the roof resembling masted ships, and the exquisitely articulated and proportioned rear façade. Joseph Philippe Karam had a consuming passion for modern architecture. He was an avid worker, known to rise early and to work late into the evening and on weekends. Although he only lived to the age of 53, he designed countless structures in Lebanon and the region. 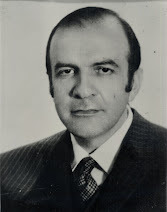 He died from cardiac arrest on 9 April 1976 while on a business trip. In 1951, Karam had married Mona George Hayek, a law school graduate. They had three children, Fadi in 1957 now a banking executive in Zurich, Lina in 1958 an artist in Paris, and Sami in 1961 a fund manager in New York. The Atelier survived under Fadi’s direction for a decade after Karam's death, but was forced to suspend its work during the civil war. Read a tribute by Karam's sons published on the 40th anniversary of his death (in French). Visit, view photos and Like the FACEBOOK page.